I wanted to stop in Lubbock because it is listed as one of the most conservative cities in the US. 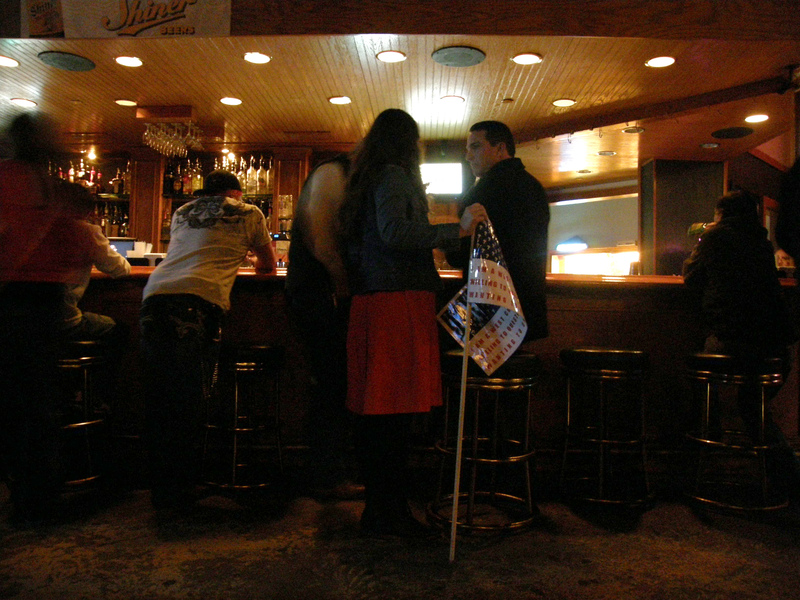 We pulled into town just after sunset, and decided a bar would probably be a good place to find people at that hour. We found a block lined with bars of all sorts and chose a smaller one with neon lights in the window and at least a few people inside. I ordered beers and asked the bartender’s advice for where to find conservative people to talk with. He asked some questions about my project, suggested some other bars in town, and seemed both genuinely curious and probably liberal leaning. The couple sitting next to me at the bar were also curious, had suggestions, and didn’t identify as conservatives themselves. Right about the time we finished our drinks the very drunk lady at the end of the bar decided she wanted to talk with me about how Facebook wouldn’t let her post anti-Obama links, but I decided to move on. Next to me at the bar were two middle aged men standing talking to each other with their backs to me. I decided to just break into their conversation with my questions, assuming it probably wouldn’t go too well, but that it was worth a try. I said, “excuse me, I live on the west coast and I am trying to learn about what our country’s political situation looks like to people who are more conservative than me.” And they bit. Especially younger of the two, who luckily, was also less drunk. He fired questions, arguments and statistics at me, with an almost angry enthusiasm. He said 41% of Americans receive some government subsidy and 50% do not pay federal tax. He said he thinks the US is heading in the direction of total bankruptcy, like Greece, because of the growing culture of entitlements. He told me to look into which states businesses are moving to, and which they are moving away from, and implied that the states with more liberal policies are closer to bankruptcy and have businesses fleeing them-using California and Michigan as examples. He said he doesn’t think social issues should be dealt with in federal politics, that they should be decided on a state level, and that states should be able to function as their own semi-independent experiments with democracy. That way we would be able to compare how more conservative and more liberal political systems would play themselves out and see what ways are more successful. He said, if government can’t run the Postal Service without going bankrupt, why would we ever trust it with something as complicated and important as our healthcare? He believes there should be a safety net, but followed that up by saying he thinks most people who are demanding benefits are just whiners. He reminded his friend, who had been focusing quietly on his drink, about when he had laid off one of his employees – who had been making over $200,000 a year – how annoying it was that the former employee hadn’t even tried to get another job, and had instead just kept collecting benefits for as long as he could. At some point, maybe right after talking about his ex-employee’s salary, he described himself as the 1%, with a what seemed to me as a defensive pride. After finishing my beer I thanked him for talking with me and excused myself, leaving with questions in my mind about whether his information was accurate and how to make my own sense out of it. Were his statistics correct about the percentage of people to receive benefits and pay taxes? (They were according to my research.) What actually caused the Greek debt crisis and how does it relate to our economy? Is there any truth the claim that the liberal states are less economically viable than the conservative ones? (The left and the right have different answers to this questions, and either way I’m not certain that the political leadership of a state is the main factor of the state’s economic success.) Before going back to our hotel our stomachs directed us to the awesome food cart Big E’s BBQ. I woke up in the morning with memories of my delicious brisket wrapped in a tortilla and haunted by with the questions raised the night before, and left Lubbock feeling both satisfied and pleasantly surprised.